I was thinking more along the lines of a swap for Shaw. Tough one. I think Shaw is the better player right now but man his injuries worry me. I don't want Bouwmmester or Muzzin myself, I just think MB will be interested in those two players. I agree I remember the 93 run and no one thought we had a chance of even winning a round. Roy and some other heroics later and we're raising the cup! Price is starting to play with confidence and swagger again. Carey is getting older himself. He might himself have a monster playoff just to cement his won career. He hasn't won a cup or really have had a stellar playoff run. If we we're able to get a LHD even a pending free agent and the price was right a 2nd or lower tier prospect or both and a center like Spezza I think it would be worth it. Someone who can win the important face offs and Spezza I think would look good with this team. As long as it wasn't a top prospect or player or a #1 pick I'd definitely Listen. Yeah.....11 overtime wins in 20 games. Weren't 10 of them in a row? I would rather keep Shaw over Brassard personally. Now if you could get Muzzin for Shaw, Benn and a 3rd I would take that even if it was Shaw, Hudon and a 3rd I would take it. Anything more than that and I would walk. My opinion is our D isn't elite but it's not the Leafs or Blues either. I wouldn't be in a hurry to trade any of our top 6 D for this year or possibly most of next year either. I don't know if Mete can cut it as a #1LHD but he is the kind of stop gap we are talking about looking for until we find our true #1, young, fast, puck moving with good scoring potential. In 1-3 years we should have a great D line up with Weber, Petry, Juulsen, Fluery and Brook down the right and some combination of Romanov, Mete, Reilly, Kulak and Ouellette down the left. Even if we lose either Weber or Petry to a trade we should be ok on the right and as long as we DON'T lose Mete or Romanov we should be ok on the left for years to come. Would I like to see a proven #1 LHD now absolutely but my opinion is don't rush it keep trying to draft one and in the mean time try and get Romanov over here next year to see if he can handle the job. In this year's draft we have Calgary's 4th round pick, Chicago and Edmonton's 5th round picks, our 6th round pick, and Winnipeg's 7th round pick. I'd be willing to part with some of those draft choices for some depth if it looks like we might make the post-season. At this point, I'd also be willing to part with someone like Michael McCarron, although I doubt there's any market for him at all. Hasn't he improved under Bouchard? He may still be a long shot to make it with a team as a 4th line center... no? I only know that he has 21 points in 32 games with Laval. I have no idea if he's improved his skating or anything else. Have to look into it... I've heard now and then that Bouchard has really helped McCarron's game. If there was an injury to Chaput, I wonder if he would get a call-up? 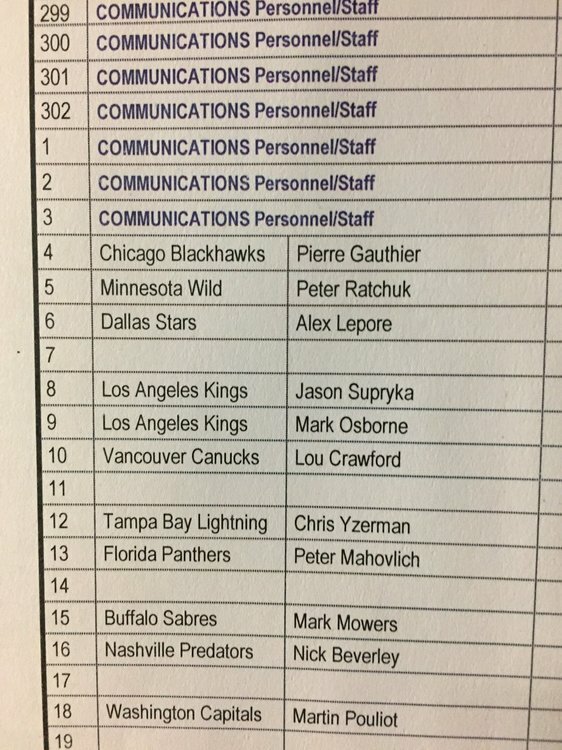 Here's some scouts that were at last nights game, whether or not they were scouting the Habs remains to be seen. No Alzner or Schlemko on the list??? I could actually see MB enquiring about Muzzin and Edler. I dont *think* he'll have any interest in Bouwmeester but you never know. I think Muzzin's price will be too high and I think we'll eventually balk at Edler too. i don't know what it would take but Muzzin for a year or two would be nice, our D would slot into more comfortable positions while they mature it would change our team for the better. we do have some forward depth we could move around like Shaw plus whatever else as long as it is a player we won't need, hard to say what that team feels it needs. Yeah Im on the fence about Muzzin because I do think he'd help in the short term. Muzzin isnt an ideal first pairing guy but would slot in ahead of everyone else on our d corps and could be a short term band-aid solution for a year or 2. However, I am pretty sure LA would want what we dont want to give up (picks, young players etc). If we could get him for spare parts - say Schlemko-Hudon-3rd or something, sure but Im assuming the Kings will want a quality prospect like Poehling or Romanov or someone plus a roster player. What I find interesting is that the Oilers 1st RD. pick is #5 on the list to be moved. Theres a few teams that apparently have their 1st in play for the right deal (Toronto too) but the Oilers' could end up being a top 10 if they cant turn yet another season around. Drouin to edmonton for their 1st? Would you want more? I really want Edmonton's 1st! I think you could get it for Drouin but you would have to take Lucic back cause they are at max cap space. If it does end up as a top 10 do you take Ryan Suzuki or someone else? - Interesting to note the Kings had two scouts there last night. They could have been there for Florida too, but with the Habs in dire need of a LHD and Muzzin reportedly being available, that has me a little worried we're in discussions about him. I'm still worried Bergevin will do something dumb like flip a 2nd rounder and a prospect (like a Ylonen) for Muzzin or flip a 3rd rounder and a lower-tier prospect (like Evans) for Bouwmeester. I just don't see either one of those guys being worth an investment. - The Oilers are more of an interesting trade option because their GM is dumb and everyone knows it, and he still makes bad trades even with everyone watching him like a hawk. We know they need a scoring winger. We know they don't really have the depth in goal or defence to deal from there either, albeit they reportedly would consider moving Talbot (doesn't help us anyways). So the two pieces the insiders say they would move that could be of value are Puljuujarvi and their 1st rounder. I would NOT trade Drouin for their 1st rounder. They could still easily be a playoff team in a very weak division and then we're left with a late first in exchange for a top-line forward (not to mention we ourselves gave up a top 10 draftee to get him). I would move Drouin to them in the off-season for their 1st rounder IF it was already established that it was a top 5 pick. Other than that, not a deal I would make. I think they could also have interest in Gallagher, who can score and is still on a very cheap contract. But in that case, I would want Puljuujarvi AND their 1st rounder AND I'd ask for a conditional 2nd round pick in 2020 if their 1st rounder is not a lottery pick this year. I don't feel pressured into making a deal with them, so they can take it or leave it if they want it. The last guy who might be of interest is Tatar, who has re-established himself as a scoring threat this season and demonstrated the time in Vegas was more an issue of fit than anything else. So if he garnered a 1st, 2nd, and 3rd at the deadline last year, I'd be preaching that his current value has to be somewhat similar. So likewise, I'd be asking for the two assets in exchange, without any conditions on whether the pick is a lottery pick or not. Tatar's a guy I'd be open to trading if the return is right, so he could be an interesting piece to dangle for Chiarelli. Don't know much about upcoming prospects, but I see he's ranked in the mid teens, could be interesting! But I'm hoping for Hughes! My thought was MB would send Petry to L.A. for Muzzin in one of his infamous 1 for 1 deals.